If there's one thing to be glad about with another loss tonight, it's that it cannot possibly be blamed on the fact that Jacoby Ellsbury was not in the lineup. And no, as it turned out, even with "all that prep time," Ellsbury did not return with a magical golden ticket to a winning streak, hidden away in his pocket the whole time. Unless we want to move into another whole realm of irrationality by asserting his play tonight was also a purposeful act of petulance. Me, I'd rather move on to other, likelier factors in the continually diminishing odds of the Sox making the playoffs this year, namely: an underachieving record against bad teams like Cleveland, especially when compared to the Yankees and Rays, and the third-base coach that's directly affected at least eight games by sending runners into outs at the plate, six of which were lost by the Sox by a run or in extra innings. Just for starters. Or then there's the always mystifying Jon Lester, who had another strange up-and-down evening in a strange up-and-down season, marked by multiple injury visits from Terry Francona before he was finally pulled with over 100 pitches in the top of the sixth. Lester had worked red-faced and dripping sweat the whole start, to the point where even his hat brim was soaked from where he'd grabbed it nervously between pitches, and he would keep up an oddly echoing pattern with the objectively less talented Justin Masterson from inning to inning. Both pitchers made groundouts on the right-hand side of the field, and mainly gave up base hits up the left field line. When they missed, they missed outside, despite their opposite-handedness and regardless of whether they were throwing to left-handed or right-handed hitters. In the third inning, Lester had seemed to be bending and flexing his left leg just slightly. That was the only indication I caught -- so quick I wasn't sure if it was real or if I was exaggerating things -- of any physical problem for Lester tonight before Francona, the trainer and Kevin Cash suddenly headed out to examine him on the mound in the top of the fifth. 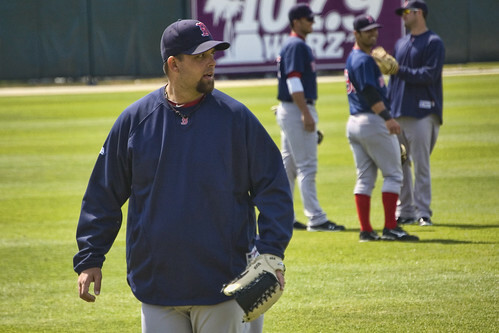 He had a brief discussion with Francona, while appearing to stretch his left calf, threw a warmup pitch, and Francona exited again -- but Scott Atchison began warming in the pen. Francona again came rushing out after the first pitch of the top of the sixth, to the shock and disgust of Lester, whose only word as Francona approached was a stone-faced, "No." But his next pitch was hit by Jayson Nix off the Fisk pole for a home run. After Andy Marte followed by singling to left, Francona came hobbling out of the dugout for a third time, and this time he would take Lester back with him. The moody left-hander spent the next few innings glowering out of the dugout, alone on the bench with his thousand-yard stare. Was it the oppressive humidity, and thus the sweating and possibly dehydration leading to a cramp that threw Lester off? The fact that this was his first start as a new father, and 'home' to the team is not really 'home' to him? Lester's home / road splits, as I recall, are in favor of the road this year as a general pattern -- why is that? Meanwhile, the Sox lineup made Masterson throw a lot of pitches, but the story for the Boston offense tonight was a familiar one -- the failure to capitalize with men on base. Not to mention Masterson, otherwise struggling mightily, playing the Sox tough again. It's probably just familiarity. I imagine if you come up with a club and watch the lineup 162 games a season for a few years, you learn their tendencies. But that's not to say the Sox hitters covered themselves in glory, either. When Papi finally got the Sox on the board with a solo homer leading off the bottom of the sixth, it had been 14 innings since they had scored on Masterson, and that was to be the end of Boston's scoring for the night. The next few innings were the kind of bullpen torchfest we've seen all too often this season, turning quickly into a blowout once Lester was lifted. And now the best the Sox can hope for is a series split with another mediocre opponent. P.S. My view of Adrian Beltre has changed as of this week. It used to be he was sort of a blank slate to me. Now, after seeing him go house on V-Mart for touching his head in the dugout and looking, as a coworker who attended the game put it, "like he was going to rip off someone's head and dump down their neck" during last night's beanball scuffle, not to mention the fact that he's broken two of our outfielders' ribs with his knee this season...I have come to realize, Beltre's a bad mofo. Possibly a Timlin-esque level of batshit, too, what with the whole head-touching issue, which is intriguing. Now, when he's shown on NESN's cameras, I prepare for riveting television to ensue. Okay, not really. But it was an excuse to break out that SG line, which I think of every time I see or hear about the actual Boof. I can't even remember what context that was in, really, and I don't know what the reference is that's probably being made there, but what can I say. When I see Boof, I think about someone calling for his head. I wouldn't go that far, but I'd be okay with a hanging wedgie in the visitors' clubhouse at the Jake for putting what had been a respectable 3-0 contest completely out of reach for the Sox. And if Joe Nelson were put in a headlock and given a savage noogie, I also wouldn't object. In the meantime, if anybody's figured out how to stay mad at Justin Masterson, let me know.